So I am well-qualified to tell you that this one is outstanding. I already sang its praises here, but I feel wrong depriving you of this recipe for Seattle’s iconic ice cream flavor from Molly Moon’s Homemade Ice Cream. Especially since, get this, you don’t need an ice cream maker to make it. Some magic having to do with the salt and the cream keeps the texture sublime, even if you make it with a pan and fork instead (directions below). If you do have an ice cream maker, you can save yourself a few minutes of stirring. Either way, this recipe will make your summer better. And probably the entire rest of your life. 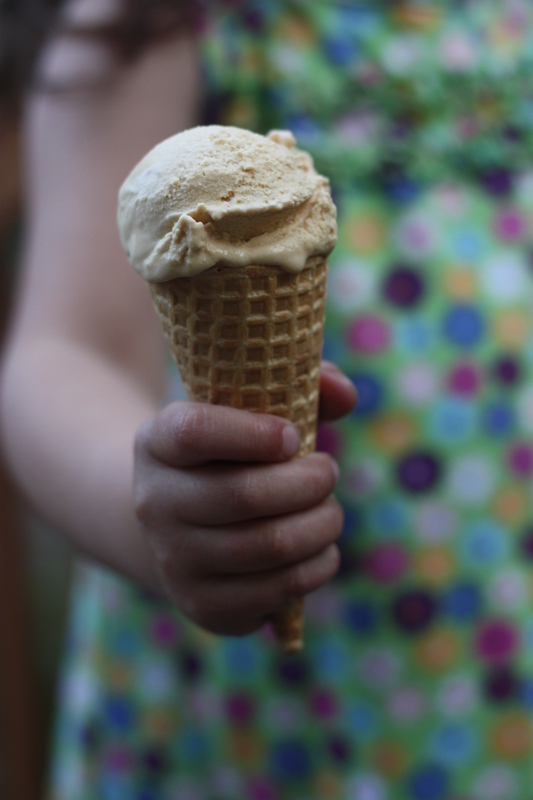 Salted Caramel Ice Cream: First, be brave, make your caramel. Line up your ingredients next to the stove: 1 1/2 c. sugar, 1 Tb. butter, 3 c. heavy cream, and 1 c. whole milk. (You’ll also need kosher salt to add later.) Put 1/8 tsp. freshly-squeezed lemon juice in a light-colored, heavy-bottomed pot and turn the heat to medium-high. Add the sugar ¼ c. at a time, stirring each addition with a wooden spoon until it dissolves completely into liquid. (Some of the sugar may crystalize on the side of your pot, just ignore it.) When all the sugar is added and dissolved, continue to cook, watching like a hawk and stirring occasionally for about 4-6 minutes. During this time, the sugar will caramelize and the color will change from a light golden to a dark amber hue (it may also begin to smoke a bit). Use your eyes, nose, and good sense to decide when you have achieved a dark-but-not-burnt caramel, and immediately lower the heat to medium-low as you trade your wooden spoon for a whisk and whisk in the butter. When the butter has melted, begin to add the cream and milk verrrry sloooowly. Seriously, slowly. The caramel will steam and bubble and some hard little caramel lumps may form. No worries, keep whisking, be patient, let them dissolve. When the mixture is smooth, remove it from the heat. Pour it into a shallow pan and refrigerate until thoroughly chilled, at least an hour. Remove the cold creamy pan of deliciousness from the refrigerator and whisk in 1 Tb. (yes, 1 Tb.) kosher salt. Process in an ice cream maker according to the manufacturer’s instructions (I churned mine longer than a usual batch, about 35 minutes, because the salt makes this ice cream so soft). Or if you don’t have an ice cream maker (or if it’s busy churning another flavor already), leave the mixture in the pan and transfer the pan to the freezer. If you’re going the no-ice-cream maker route, stir the mixture thoroughly with a fork every half hour or so until the entire pan of ice cream is a uniform texture (at first it will freeze around the edges, then you will stir it up, then it will freeze around the edges again, etc.). When your ice cream is ready (it will still be quite soft), transfer it to a sealed freezer container and freeze at least four hours before serving. This ice cream never freezes very hard because of the salt content, so plan to serve and eat it quickly! Note 1: I thought that the saltiness of this ice cream was perfect. If you find the finished product too salty-tasting, however, serve it over a rich brownie or under a blanket of hot fudge. Now it’s perfect, right? Note 2: This magic no-ice-cream-maker method works better with this recipe than with others I’ve tried it with. Just a heads up in case you plan to use this method with other recipes: it always works, but usually the texture of ice cream made with the fork-and-pan system is icier/grainer than ice cream made with an ice cream maker. With this recipe, however, the results were indistinguishable. This looks so good I could make it for breakfast. Hmm…. 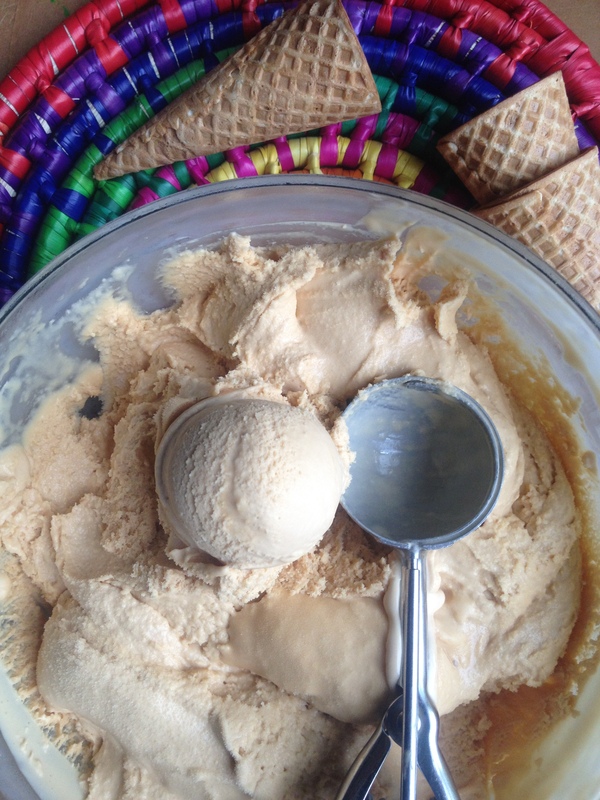 You know I love my ice cream maker, but I will for sure have to give this recipe a try! WOW! That looks OUT OF CONTROL good! Salted caramel is my favorite!! I don’t think I would have said that before but, wow, this ice cream is definitely my favorite! Oh dear I love Molly Moon’s ice creams… all except for the salted caramel ice cream. Haha! You either love it or hate it I guess. My boyfriend is however crazy about it. And seeing as I don’t have my ice cream maker for the summer, I’m going to have to give this a try! i love every bit of this! I can’t wait to try it! I have tried making other ice creams without an ice cream maker and they usually end up icy–I think it’s something about the salt and the high fat content of this one that makes the fork-and-pan method so successful! This looks wonderful! I’m definitely going to try it. Yum! Thanks for sharing your method for making ice cream without an ice cream maker. I’ve been getting so jealous of all the other blogger’s kitchen tools! Salted caramel ice cream is one of my absolute favorite flavors. That and grapenuts. I know. It sounds strange, but it’s delicious! And I love that you don’t need an ice cream maker. Have to make some room in the freezer for this one! Thanks for the great recipe, Emmy! Wait, what’s this about grape nuts? That’s crazy! Like vanilla ice cream with grape nuts? Don’t they get soggy? There is this ice cream place on MIT’s campus across the river that I was completely addicted to in college called Toscanini’s. They had a Grape Nuts flavored ice cream. With raisins. Like you let grape nuts get soggy in milk and then added lots of vanilla sugar and dried fruit. And right before it the ice cream hardened up, you blended a little bit of fresh cereal in for crunch. I missed a lot while I was out of town, thanks for saving dessert for me! Wow, Emmy! Ice cream is the best food in the whole world, and this looks incredible. I love your photos. How funny — I also worked at Baskin Robbins in high school, but I didn’t meet my J there (and I have no thrilling or scandalous story to tell about how we met, either, despite how much I love our life together). I just love your blog: the recipes, photos, stories, and especially your sweet, funny and kindred personality that comes through. Just made a batch — added a litlle chocolate syrup and maple-glazed bacon bits for the crunch! Much thanks!